Lucas is different than the other kids and he is often bullied by one boy in particular, Sid. Sid takes Lucas' hat and sprays him with water and to take out his frustrations, Lucas in turn bullies the ants. To teach Lucas a lesson the ants take him to their queen ant. The Queen ant has the wizard ant shrink Lucas so he can live and work as an ant so he can appreciate what they do. Lucas gathered food, defended the colony, and attended to the queen. The queen has Lucas turned back into his normal size and when Lucas wakes up, he sees that the ants have decided to teach Sid a lesson because how he is ant size. 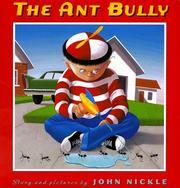 Nickle, John, “The ant bully,” Children's Picture Book Database at Miami University, accessed April 21, 2019, https://dlp.lib.miamioh.edu/picturebook/items/show/8038.